What's Really Going On With Solar Stocks? Understanding how efficiency and cost per watt affect solar manufacturer's competitive position. To really understand how the solar industry works, investors need to understand its cost dynamics. Cost-per-watt numbers may catch headlines, but efficiency is equally as important. And the dynamic between the two isn't explained well by companies who want to disclose enough information that investors can understand them -- while withholding enough so that competitors can't gain an edge. So that leaves us to try to parse through the mumbo-jumbo to try to explain who has a competitive edge and the reason why. We've established that cost per watt and efficiency are two of the three most important words in solar, along with bankability. If we start with efficiency we can break the companies into three categories. First Solar (Nasdaq: FSLR) is the least efficient with 11.6% efficient panels. I have lumped Chinese manufacturers in one category at 14.7% efficient because we know there is very little efficiency differentiation between them. And SunPower (Nasdaq: SPWRA) leads the pack with 19.5% efficient panels. Cost per watt is relatively simple for the manufacturers who provide this number explicitly. I am using Trina Solar's (NYSE: TSL) $1.16 per watt cost for Chinese manufacturers because this is the lowest published number. First Solar and Sunpower come in at $0.75 and $1.71 respectively. Balance of system costs is a little more complicated and requires a few assumptions by anyone making a model. I've assumed that First Solar's balance of system cost per watt is $1.50, and others are adjusted based of efficiency (with 10% of BOS costs fixed). Efficiency is a good adjustment because land would be a significant portion of BOS costs and can be used to approximate other costs. After that I make the assumption that a development costs $3.50 (based on published data), back out margins and double-check that they are reasonable, based on company financial data (they are). And that gives us the chart below, which should be in the right ballpark. The margin would have to be shared between panel manufacturers and developers, but they're in line with what you would expect from each company. First Solar has the highest margin followed by Chinese manufacturers and SunPower. Now that we understand the basics we can see how these dynamics might change in the future. Costs are falling for most manufacturers but at different rates. That will change the competitive landscape going forward. In recent quarters Chinese manufacturers like Trina Solar, JA Solar (Nasdaq: JASO) and Suntech Power (NYSE: STP) have found it harder to cut costs. Silicon prices are no longer falling at the rapid pace they did through 2009, and manufacturers have found it harder to cut other costs. Meanwhile First Solar has steadily cut costs by increasing efficiency and improving technology. Below you can see how cost per watt has changed over the last year and Trina Solar trails both First Solar and Sunpower in cutting costs. Over the next year the biggest change may happen at SunPower where the company is planning to cut cost per watt from $1.71 to $1.48 in 2011. 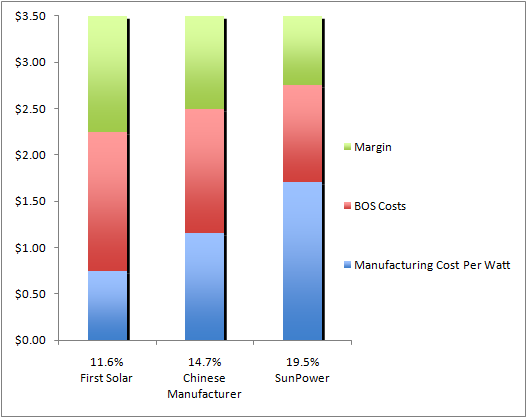 That 13.5% drop in costs should help improve margins and put SunPower in a better competitive position. And if SunPower's plan to cut costs to $1 per watt by 2014 comes true it will put more pressure on manufacturers like Yingli Solar (NYSE: YGE) and LDK Solar (Nasdaq: LDK) to cut costs and improve efficiency. And there's also SunPower's Oasis cost reductions plan on cutting BOS costs 25%, which will help SunPower's panel pricing power. Picking solar stocks can be tricky but the first step is understanding a company's competitive position. First Solar is definitely the leader right now and its industry leading margins are a show of its power in the industry. But the dynamics will change as time goes on and efficiency leader SunPower has an opportunity to move ahead of Chinese manufacturers if they can't cut costs or improve efficiency.